A Spring season of top acts and emerging artists from the jazz, soul and funk world has been announced by Sage Gateshead today. The Comet is Coming, Booker T. Jones and Ronnie Scott’s All Stars are among the highlights for Spring 2019. Sage Gateshead’s New Year New Artist Festival in January will showcase some exciting, new generation artists including Vels Trio and the math rock and electronic sounds of Slow Loris and Purple Shirt. April 1 will see the first North East visit for Mercury Prize nominated, cosmic-psychedelic jazz trio The Comet is Coming. And in May the pioneering Gondwana records label (home to GoGo Penguin and Portico Quartet) celebrates 10 years with a special one-nighter featuring first visits by Mammal Hands, Matthew Halsall & The Gondwana Orchestra, Noya Rayo and more. In My Life began this afternoon's King's Hall concert. 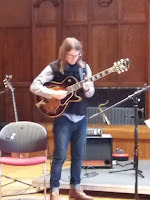 Bradley Johnston's arrangement for solo guitar of the Lennon and McCartney song took as its inspiration Pat Metheny's recordings for solo guitar. 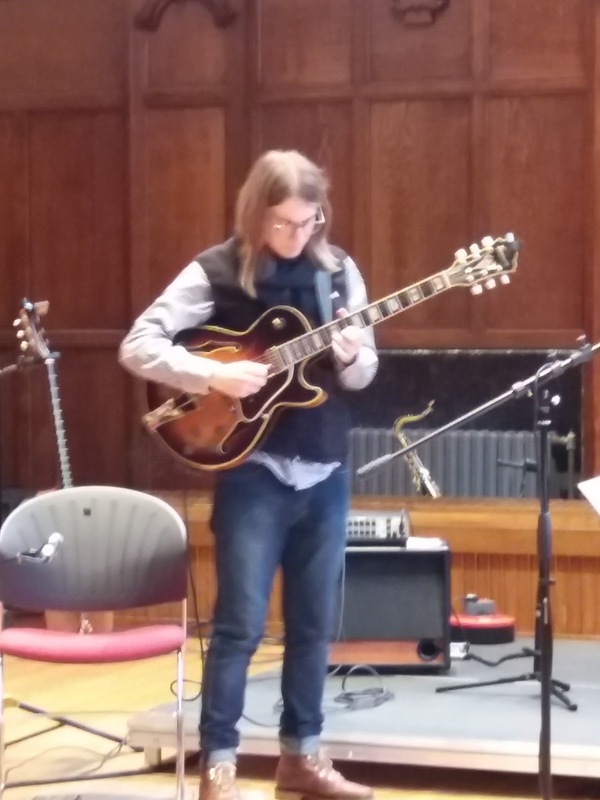 The Wearside based guitarist, forging a career as a gigging musician and tutor, switched between one of three guitars during a set of fifty minutes and more. Assisting BJ were regular collaborators Paul Grainger, bass, and drummer Russ Morgan, alongside the welcome figure of Keith Robinson playing tenor sax and, on one number, clarinet. The remainder of the programme comprised no fewer than seven of Johnston's compositions. For Joe unsurprisingly paid homage to the great Joe Pass (many years ago the American memorably gave a solo recital at the Gosforth Park Hotel). BJ knows his Joe Pass...Ella, Oscar et al and this blues in G surely had the great man applauding from up there in the jazz club in the sky. Not one but two singing pianists, two guitarists, two bass players (yes, for once Mr PG got the opportunity to go to the bar! 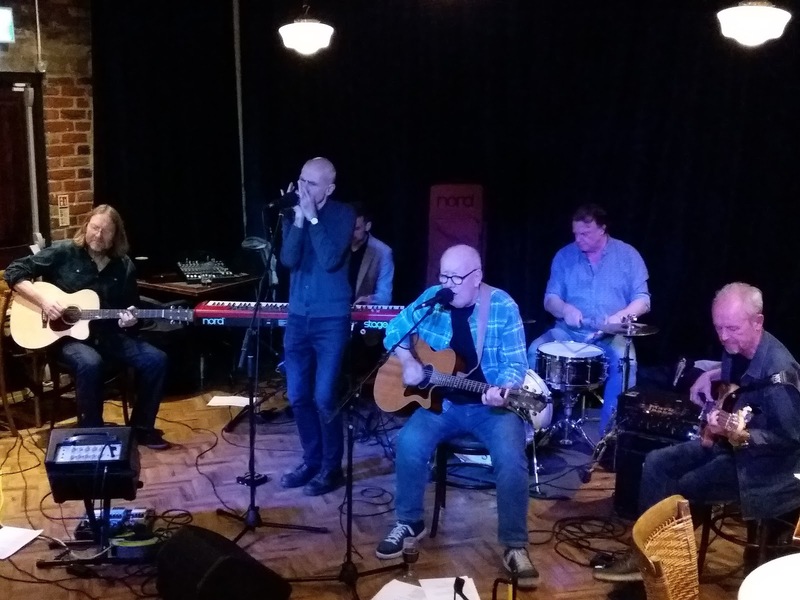 ), four drummers (two of them Archies), a tenor player, a chromatic harmonica player and a partridge...oops, wrong story, and a chart-topping soul singer - just yer average jam session down at the Dun Cow. The house trio got things underway with Paul Edis singing I'm Old Fashioned. Don't know about that, but Dr Edis is one hell of an old school (ie great) piano player. Time After Time, All the Things You Are - the latter featuring Edis' stupendous piano playing - two-handed stuff, Bach-like things going on etc. Quite some start. 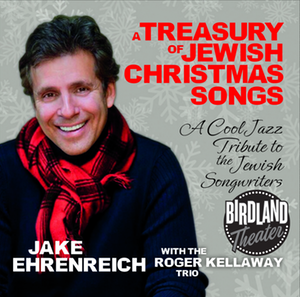 Paul Jones (vocals/harmonica); Mike D'Abo (keys/vocals); Tom McGuinness (guitar/vocals); Mike Hugg (piano/vocals/perc. 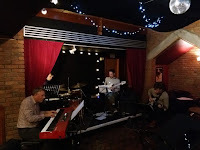 ); Marcus Cliffe (bass guitar/vocals); Rob Townsend (drums/vocals); Simon Currie (tenor sax/soprano sax/flute/vocals) + GEORGIE FAME (keys/vocals). 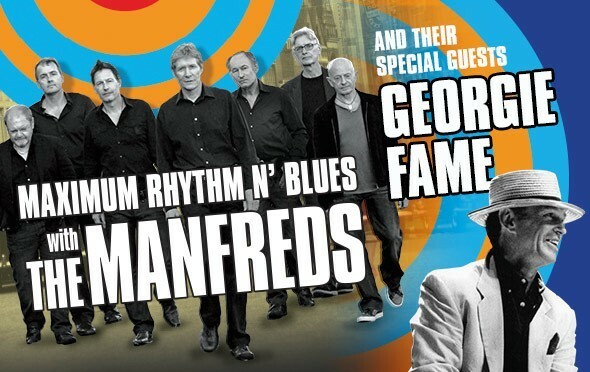 I'd already seen Georgie Fame twice this year but those gigs were at the GIJF in the same hall and at Ronnie Scott's. Both sessions were with the Guy Barker Big Band so I assumed that last night, with the Manfreds, would be poppier and less jazzier. Well, yes and no. Yes, he did concentrate more on his "this reached number one in 1964" songs but the treatment was longer and no less jazz/blues influenced. The same could be said for the Manfreds who also rolled out the hits but blew the jazz on the solos. "It's 1962 and we're at the Marquee Club in London" proclaimed the voice from the unlit stage. Then the lights came on and the voice was that of Paul Jones who, with his fellow Manfreds, immediately launched into Smokestack Lightning. He sang the blues, wailed on harp before giving space to Currie, Hogg and McGuinness. 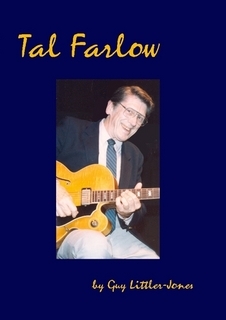 Bedford based guitarist Guy Littler-Jones' biography of innovative jazz guitarist Tal Farlow was first self-published in 2007. 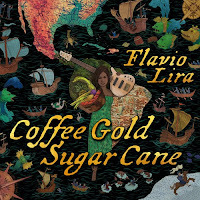 It can currently be accessed on www.lulu.com and boasts a plentiful array of discographical and musical/technical information that will delight and benefit any guitarist, regardless of level or stylistic proclivity. Littler-Jones discusses the guitarist's life and music from his early years, through his mid-career when he was most noted for his lightning speed of execution, and into his later years when his playing, although still highly complex, entered a more lyrical phase. More from Camden cameraman Mochles Sa. This time it's shots of drummer Antonio Sànchez at London's Jazz Café as part of our capital city's EFG Jazz Festival. Mochles tells me the lighting was so ridiculous that he was unable to get any decent shots of the rest of the band. Being a man who lets his camera do the talking his only observations were that Sànchez made a political speech against President Trump and spoke of the global crisis of migrants in Europe and USA as well as the reaction of politicians to the poverty of these countries. Bebop Spoken Here is up for most things and an evening of contemporary dance at Sage Gateshead held few fears. The main attraction for this jazz blog was the world premiere of Jason Holcomb's commissioned piece titled Sacrification for choreographer Eliot Smith's Poppy. The five-strong troupe - two female dancers and three male dancers including Smith - took to the stage in a darkened Sage Two daubed in the filth and mud of WWI trenches. 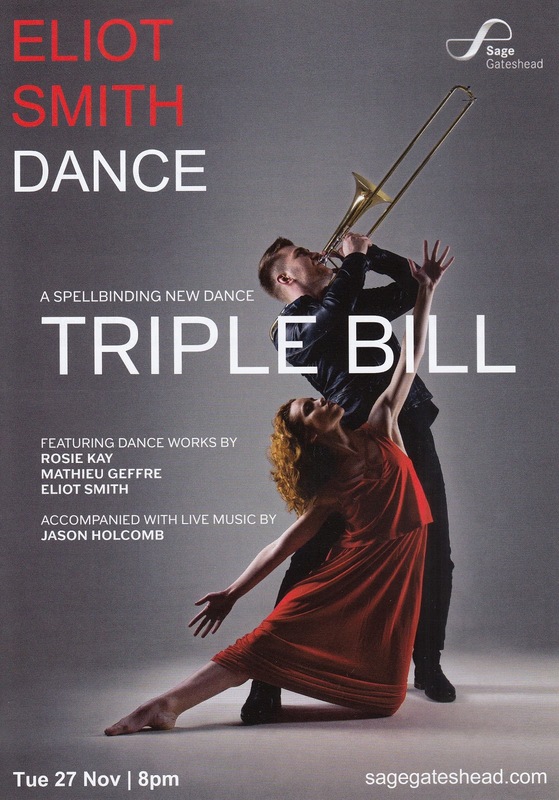 Barefoot, the Eliot Smith dancers moved across a poppy-strewn field/stage as the first notes of Jason Holcomb's trombone rang out across the auditorium. Dressed in black and fitted with a radio mic, Holcomb moved around the hall, first one side then another, continuing to play as he exited one door, reappearing seconds later on an upper level, all the while the on-stage dancers reacting to the trombonist's composition. Our roving photographer Mochles Sa sent us some stunning shots of trumpet player Terence Blanchard at the Jazz Café in Camden. 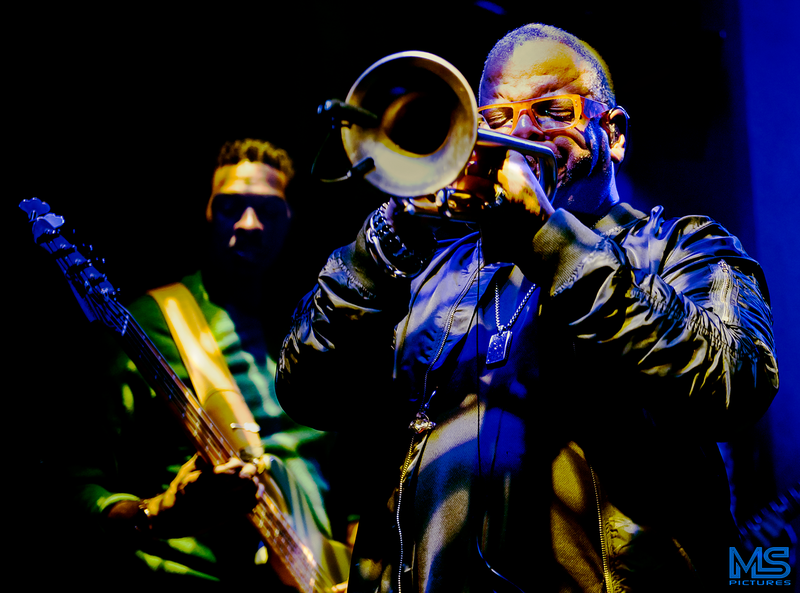 “Music and art have the power to change hearts and souls,” expresses composer and trumpeter Terence Blanchard — a belief brought to life through the music of Blanchard and his E-Collective. This revolutionary ensemble thrives off the perfect mixture of Blanchard’s genius and the innovations of four young musical pioneers: guitarist Charles Altura, pianist Fabian Almazan, bassist David “DJ” Ginyard Jr., and drummer Oscar Seaton. I knew I’d reviewed a CD from this fine singer before, as I remembered her biographical details. Ms Allen hails from Pittsburgh growing up in a musical household with a singing mother, guitarist brother, as well as playing flute and piano herself. After hearing all the classic jazz singers on the radio, she later sang in choirs and also professionally in duos. 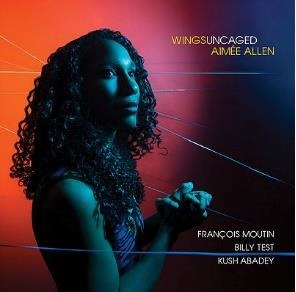 A member of the New York jazz community since 2002, recording her debut release in 2006, this, her fifth CD comprises 6 standards and 5 original songs. 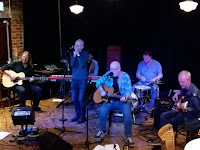 James Birkett is rarely seen on the jam session circuit but, tonight, he was part of the house trio and much appreciated by a decent turnout despite the atrocious weather and a couple of competing events at Sage Gateshead and the Bridge Hotel. As always, on these occasions there were highs and lows but, whatever, all taken in good spirit by players and listeners alike. Stu Finden toted a gleaming baritone sax to great effect on Stella by Starlight and Yardbird Suite whilst Mrs Finden sang You Go to my Head with Mr Finden helping out on double bass. A little more volume on the mic would have helped the vocal. No such problems for Niffi who worked out on Do Nothin' Till You Hear From me and Let's Call the Whole Thing Off. It had been a while. 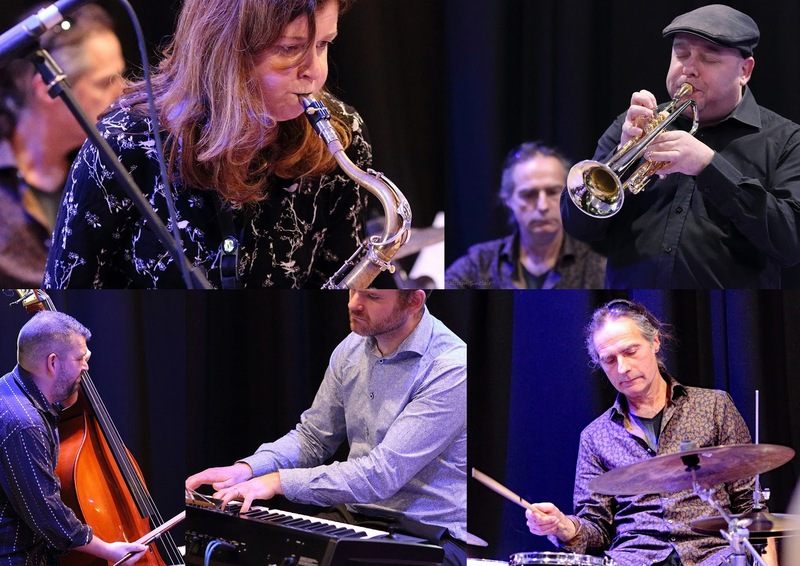 Ruth Lambert recently returned to performing with the Customs House Big Band but this trio gig was a first opportunity to hear Ms Lambert in an intimate setting, up close, singing to an attentive audience. Taking a Chance on Love (comp. Vernon Duke) for starters. Sure enough, Lambert was as good as ever, singing gems from the Great American Songbook. No Moon at All, Here's That Rainy Day (the first of two Van Heusen/Burke numbers), What is This Thing Called Love? - Lambert the supreme interpreter of timeless material. What's more, Lambert's musical associates - Giles Strong and Paul Susans - offered impeccable support during the evening. Bebop most certainly wasn't spoken at the Classic Jazz Party 2017 (nor this year or any of the previous years either!) However, that doesn't mean that the music, despite its antiquity, isn't worth checking out. Good jazz, like good classical music, is timeless and the CJP is living proof of that. Each year the party has (plus or minus) the same core of musicians from America, Europe, and the UK corralled into various themes by Keith Nichols and his team. 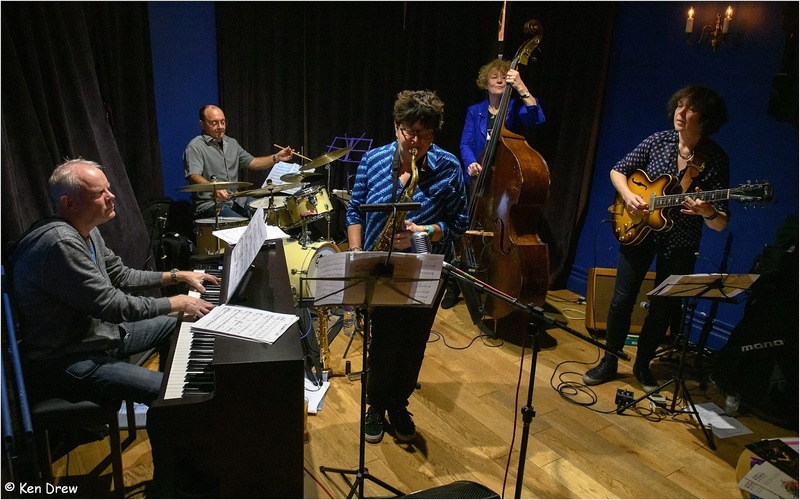 Sue Ferris (tenor sax/flute); Graham Hardy (trumpet/flugelhorn); Paul Edis (piano); Paul Susans (bass); Rob Walker (drums). 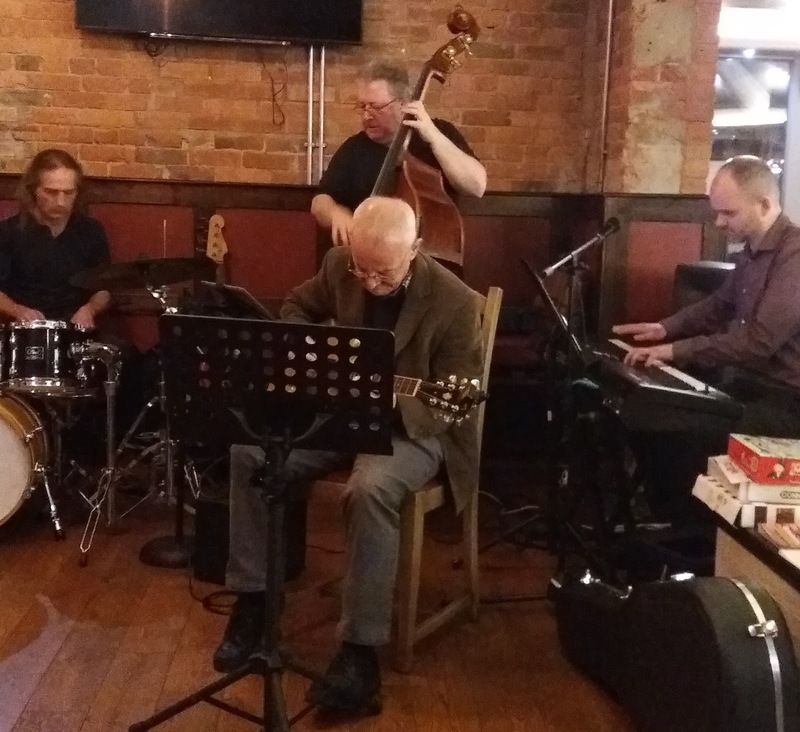 There’s something about Lunchtime Jazz that’s really taken off since Paul Edis started the lunchtime concerts at the Lit and Phil some five and a half years ago, followed later in the year by the Durham Gala series. 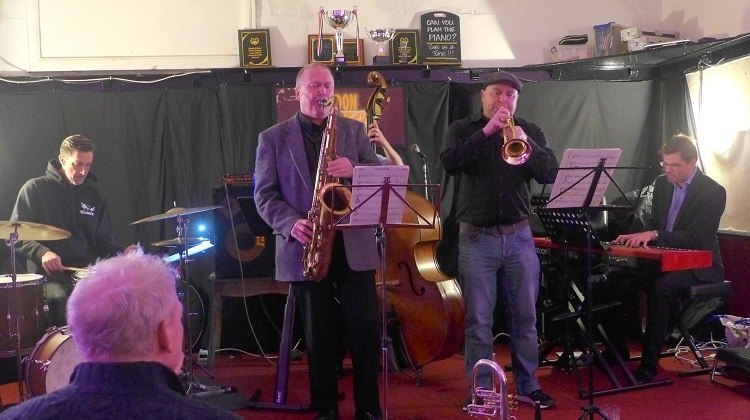 Now you can virtually find one on almost every week, with Bishop Auckland Town Hall Jazz, organised by Mick Shoulder and Jazz at the Lubetkin in Peterlee started this year by Emma Fisk. Whilst the Lit & Phil is often packed out – even to the extent of some discomfort – the Gala concerts win out for audience numbers, with punters now having to book 2 – 3 months in advance. The Gala Studio has recently been partially refurbished with new lighting that gives all of the audience a good view of the musicians and makes for a much clubbier atmosphere. From the beginning the musicians have always commented on the good acoustics, as well as the good response their music elicits from the appreciative audiences. It’s just a shame that the Gala management won’t buy another 20 seats, so the Studio fills to its 120 capacity, and people who turn up on the day aren’t left waiting for returns or worse turned away. Helena Kay (tenor sax); Ferg Ireland (bass); David Ingamells (drums). With tonight's BBC Young Jazz Awards on BBC4 this seems to be an appropriate time to introduce a CD by another young award winner - Helena Kay. 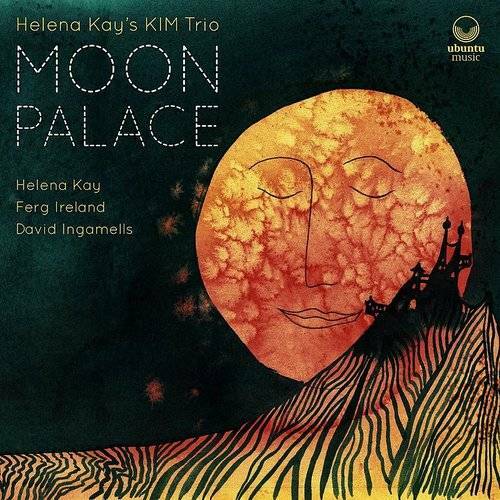 Helena, Young Scottish Jazz Musician of the Year in 2015 and winner of the Peter Whittingham Award two years later, makes an impressive showing with this, her debut album. That she chooses a trio format sans guitar or piano to meet the world could be seen as brave, foolhardy or a display of confidence in her ability to pull it off - rather like an aerialist tightrope walker attempting to cross the Thames on his/her first gig. 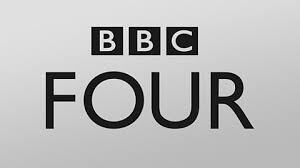 If you're staying in tonight then BBC4 is the place to be. They're showing the final of the 2018 BBC Young Jazz Musician of the Year competition that was held at the South Bank Centre as part of the EFG London Jazz Festival. The five finalists for this year's award were Xhosa Cole (saxophone), Reuben Goldmark (piano), Fergus McCreadie (piano), James Owston (bass) and Seth Tackaberry (bass). May the best musician win. The programme goes out at 21:00 hours. Earlier, at 20:00 hours, Soweto Kinch takes us on his own journey through jazz in London, New Orleans and New York. The programme is repeated at 02:30 hours. 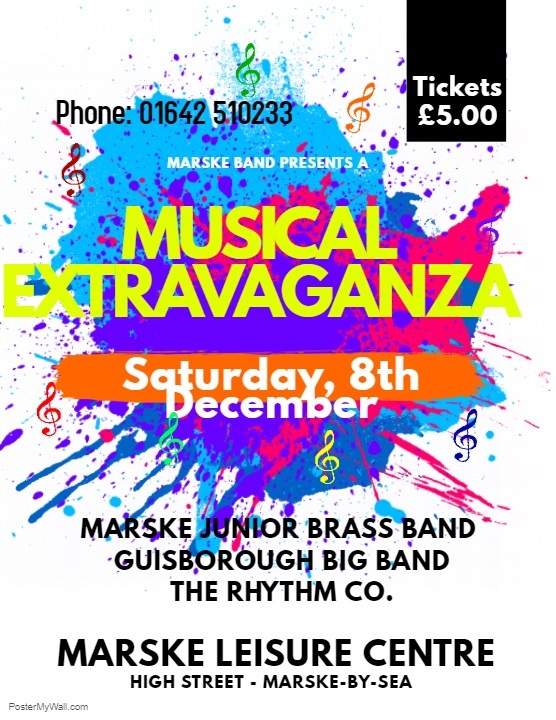 I'm informed there are still some tickets left for a fundraising event in aid of Marske Brass Band on Saturday the 8th December at Marske Leisure Centre. Three fabulous bands are performing on the night. 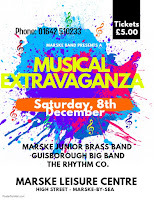 They are Guisborough Big Band, The Rhythm Co and, the musicians of tomorrow, Marske Junior Band. Tickets can be ordered from 01642 510233. 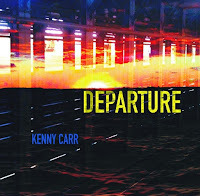 Kenny Carr (guitars, synthesisers); Donny McCaslin (tenor sax); Kenny Wollesen (drums, percussion); Hans Glawischnig (bass). 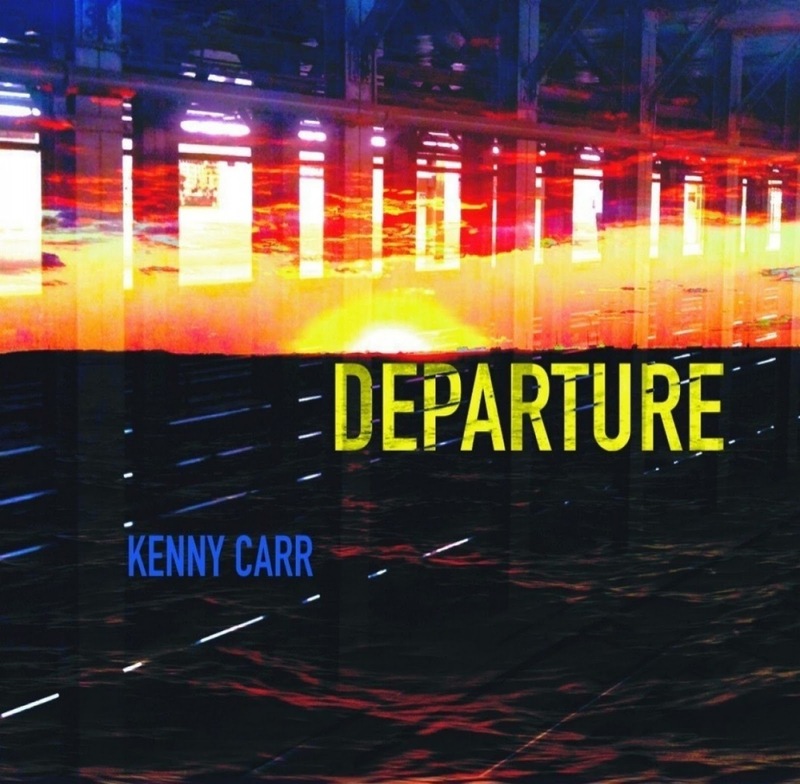 Departure is Kenny Carr’s sixth LP as a leader and the second in a row with this line-up. Having spent the early part of his career as lead guitarist in the Ray Charles live band, Carr seems to have manoeuvred himself slightly since Charles’ passing, spending a greater amount of time in more traditional jazz contexts. Despite this, his style still retains the rocky, bluesy, accessible elements of Ray Charles’ music which enabled his incredible worldwide success. These are strong particularly in the ostinato and riff-driven tunes which periodically appear throughout Departure, such as Tell Me I Can’t, and D&P. At times, these simpler harmonic frameworks are highly successful. 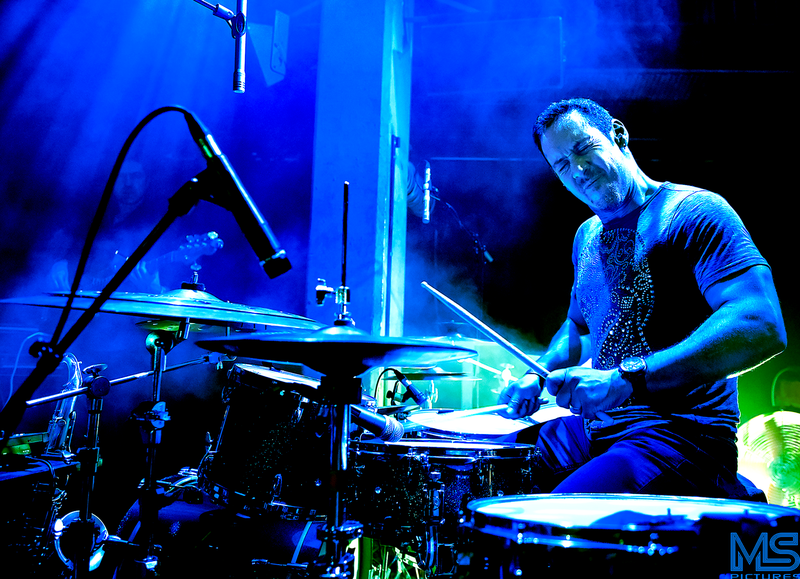 For example, on the album’s sixth track Evolutions; the uncomplicated undulations between chord one and chord four in the solo section acting as a perfect frame for Carr and Donny McCaslin’s (tenor saxophone) improvisations. The harder end of this scale though is also felt on tunes such as Time Change. Here the frequent returns to the opening ¾ ostinato almost begin to verge on monotony. A rare blues gig at the Collingwood Arms featuring an equally rare acoustic performance by King Bees...that was Friday night out sorted! 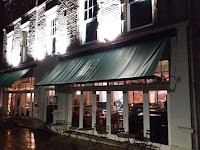 Brandling Village regulars occupied their usual seats or stood at the bar engaging in animated chatter as the best blues band in the land set up in amongst the drinking, pizza-eating crowd - your correspondent opting for a rather decent pint of Landlord. Dominic Hornsby sat at the pub's upright, Giles Holt rested his snare on a low bar stool, a seated Simon Hedley retracted the spike on his string bass, Scott Taylor sat on a stool, harmonicas laid out on an adjacent stool, and fellow frontman Michael Littlefield sat, then stood, playing acoustically, on some numbers making good use of his National Steel. You wait 11 months for a 'Quintet of the Year' to come along and, within less than a week, you have two of them! Nothing could ever top Sunday's session at the Black Bull with the Mick Shoulder Quintet but, and here's the rub, nor could anything top the Alison Rayner Quintet at the Globe last night. Two great bands, one updating the past and one bringing the future closer. Let's just say that I wouldn't have missed either. A co-promotion by the Jazz Coop and JNE as part of the latter's Women Make Music series, this was an unmissable event and the crowded Jazz Bar seemed to agree. We rarely publicise gigs outside of the northeast unless it's a one where we have a presence or it involves a favourite of ours. 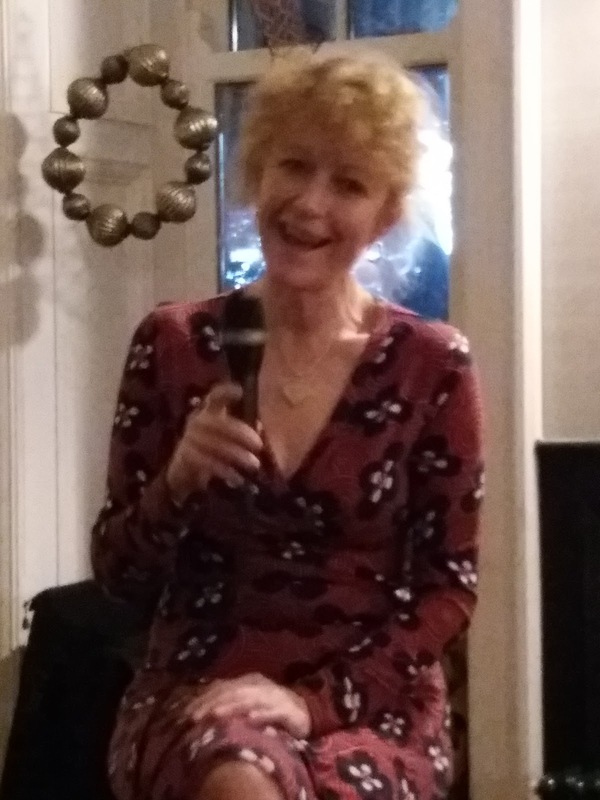 Tessa Souter is just such a person, Tessa became a favourite when she wowed the normally blasé Cherry Tree audience in 2016 accompanied by the Pete Gilligan Trio (see pic). Pete, Paul Grainger and Russ Morgan gave the New York singer the support she deserved and the music lived up to the late jazz eaterie's reputation for providing the best in food and jazz every Monday evening - ah! those were the days. Tessa is in London on a flying visit and has asked me to mention a gig she's picked up at short notice and, coming only days after the EFG when fans are maybe jazz-lagged, it may need a wee push. 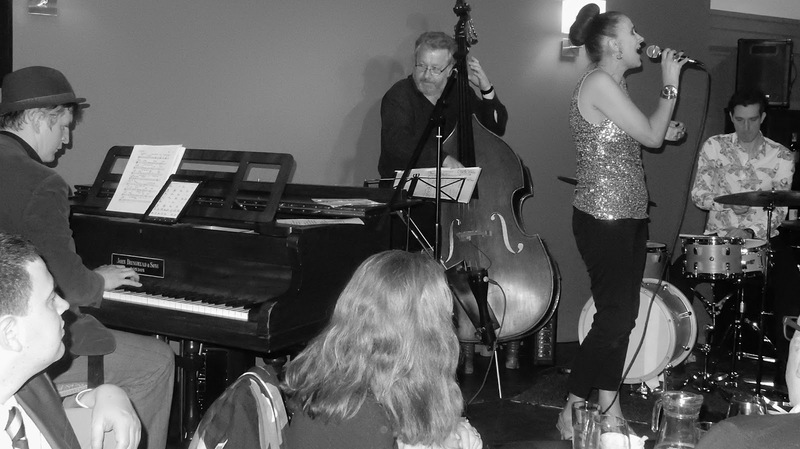 Tessa Souter w. Sean Hargreaves, Neville Malcolm and Winston Clifford @ The Woodman, 414 Archway Rd., London N6. Nov. 27 start 8pm. Free. *Tessa's most recent CD Picture in Black and White has received rave reviews. 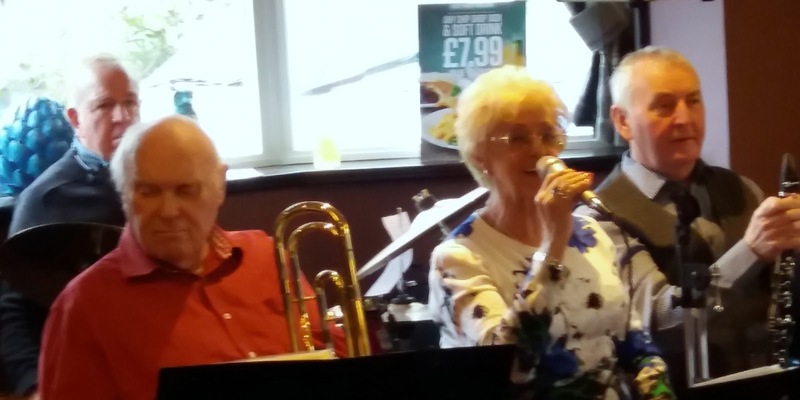 Fresh from another successful weekend away in Bellingham Maureen Hall's Rendezvous Jazz reported for duty at the Monkseaton Arms ready to resume the band's ever-popular weekly residency. It was good to see Don Fairley back on the stand, taking his seat alongside Jim McBriarty, either side of band leader Maureen Hall. That Teasin' Rag got things underway, Do You Know What it Means to Miss New Orleans? with Hall's vocals, then drummer George Davidson singing Hello Dolly, a typically varied Rendezvous Jazz setlist. Rockin' Chair, Hall again, this time singing We Shall Walk Through the City (Don Fairley's quicksilver trombone solo), the London Pride tasting just fine, a nice way to spend an hour or two down at the coast. Raffle time, nothing new to report there. Gig number two on a damp November evening. Having left Prohibition Bar it was a short walk across the High Level Bridge to Newcastle Arts Centre to catch the remainder of the Strictly Smokin' set in the basement Black Swan Bar. 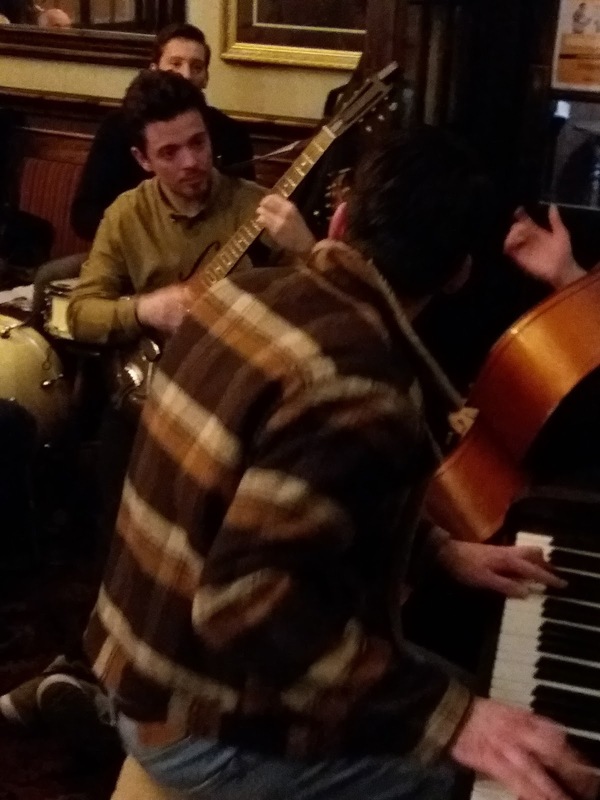 Playing to a 'select' audience, the Strictly Smokin' rhythm section boys were having a ball. It was one of those gigs when musicians play for the love of it, to hell with the absentees. The SSBB horns given the night off, this was an opportunity to hear guitar, piano, bass and drums stretch out. On entering the Black Swan Bar guitarist Pav Jedrzejewski was in full cry on Chick Corea's Spain. Two gigs in one evening. Possible, but a degree of planning was essential. Curiosity took your correspondent south of the river to Gateshead's Prohibition Bar to check out Teesside's Radio Pensacola Band. Straighten Up and Fly Right sang Django. Django? Reinhardt...no, not quite. Spaghetti western Django...no, not exactly. This Django was the zoot-suited frontman of the Radio Pensacola Band. Pensacola, Florida could well have something in common with Teesside but at the time of writing (gone midnight) nothing springs to mind. Stanley Clarke (basses); Evan Garr (violin); Beka Gochiashvili (piano); Cameron Graves (keys); Salar Nader (tabla); Shariq Tucker (drums). Had somebody asked me which living jazz artist I'd most like to see, Stanley Clarke would have been high on the list, or maybe even top of the list. The announcer outlined his plaudits and achievements, including transforming the bass into a lead instrument laying down melody and harmony, and while nothing is ever quite so simple and straightforward, he was certainly the defining moment for the electric bass in Jazz. 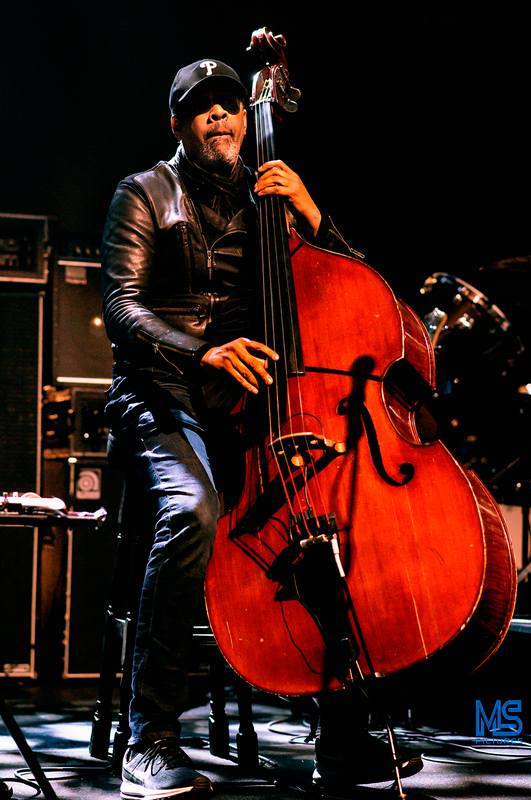 He adopted the slap bass technique pioneered by Stone Family member Larry Graham, more than Carter, Holland, Vitous, Henderson or even Johnson and Pastorius, displaying levels of virtuosity never seen or heard before, and I would argue, since. The announcer went on to say that working with young musicians is his proudest achievement, giving fore-warning of the band he would lead out. Thanks to Pub Culture (Dun Cow, Fire Station, Peacock in Sunderland, Dun Cow, Jesmond, Newcastle) acquiring and redeveloping the long-since closed Flynn's pub on Newcastle Quayside, veteran bluesman George Shovlin has set about establishing a blues night at the company's latest addition to its portfolio. Rezzonator Music is delighted to announce the original music score to the award-winning “The Jazz Ambassadors” documentary will be available to download on all digital platforms and streaming via Apple Music and Spotify from 25th November 2018. A THIRTEEN/Antelope South/Normal Life Pictures co-production, in association with BBC, ZDF and Arte, “The Jazz Ambassadors” tells the extraordinary story of America’s plan to win hearts around the world and counter the Cold War with the USSR in 1956 with the help of America’s most influential jazz artists. Over a period of ten years, performers including Dizzy Gillespie, Louis Armstrong, Duke Ellington, Benny Goodman and Dave Brubeck, along with their racially-integrated bands, travelled the globe to perform as cultural ambassadors and became ‘America’s coolest weapon in The Cold War’. Kevin Eland (trumpet); Donna Hewitt (tenor sax/clarinet); Django (tenor sax/vocals); Dave Archbold (keys); Ron Smith (bass); and Mark Hawkins (drums). A special guest night with Radio Pensacola led by Kevin Eland who played music mainly from the '20s '30s and '40s. I'm not sure where the band's name came from other than that there is a radio station of that name in Florida so maybe it relates to someone's holidays or harks back to when Kevin was working the cruise ships. Straighten Up and Fly Right followed by Ain't Misbehavin' got the evening underway. Both had vocals from Django and nice solos from Donna on tenor and Ron on bass. 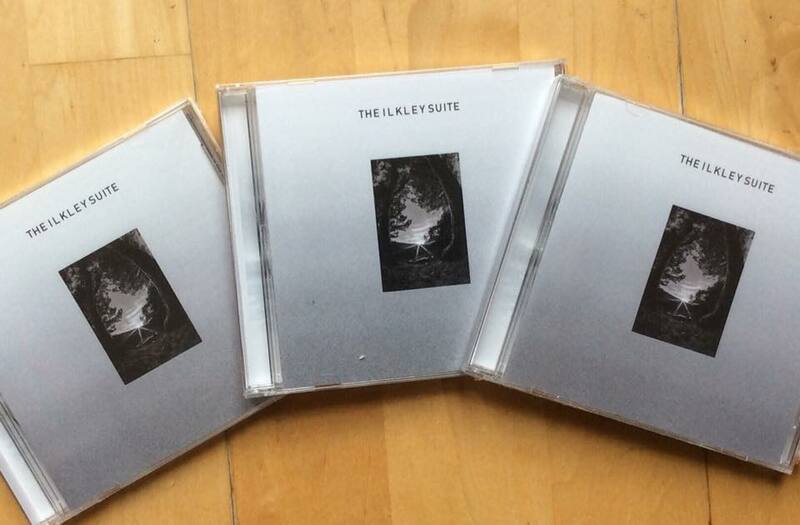 It had to happen eventually, even to an award-winning jazz blog – the first of the seasonal CDs up for review. After hearing the album, I decided I didn’t mind at all. Any possible irritation with being reminded yet again of the time of the year etc was soon lost on hearing this well known, top class, trio, with a singer whose voice has shades of Nat King Cole, giving performances of songs that you never dreamt were written by Jewish songwriters although, in retrospect, you realise most of the standards were!. 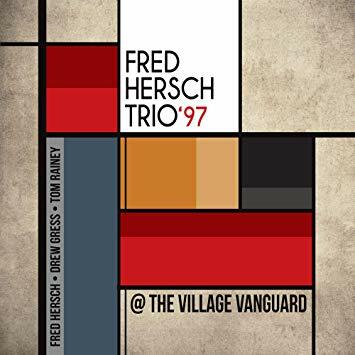 In July 1997 jazz piano master Fred Hersch took his trio with Drew Gress and Tom Rainey into the iconic Village Vanguard nightclub in New York for the first time as a band leader rather than as just a sideman. The three Friday night sets of the week-long engagement were recorded but never released. 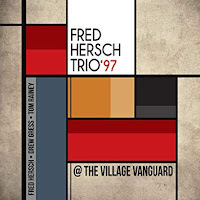 Now, twenty-one years later, Fred has chosen to do just that and provide us with his favourite moments from this occasion in the form of the eight tracks on this CD – a mixture of Gasbook standards and original pieces. This is, in fact, the only “live” recording of this particular group and at this time, they were determined to make a name for themselves on the world stage. 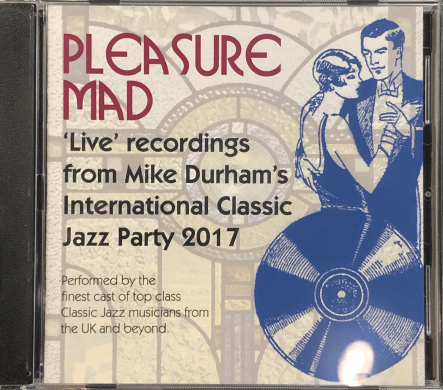 There have been innumerable books written about our music (I've got three shelves full and that is but the tip of the iceberg) so, when I say that this is essential reading for anyone interested in modern jazz from the late thirties on, you'd better believe it! 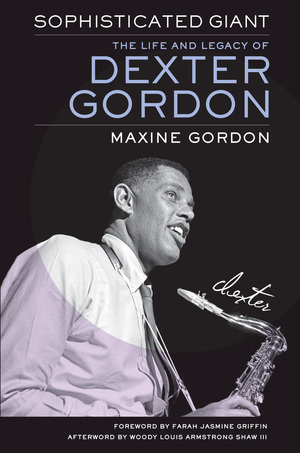 More than a biography and not quite an autobiography, Maxine, Gordon's widow from his last marriage and mother of trumpet player Woody Shaw's son*, manages to successfully incorporate the great saxophonist's own handwritten memories of his life along with her own reminiscences and those of his contemporaries. Not just musicians such as Jimmy Heath and Sonny Rollins but also Alfred Lyons and Francis Wolfe who recorded the wonderful Blue Note albums by Dexter that set the standard for pre-Coltrane tenor playing. American trombonist Jason Holcomb is to premiere a new work at Sage Gateshead on Tuesday (Nov 27). A co-commissioned work for Eliot Smith Dance and the Royal British Legion Sacrification examines the conflict and human consequences of WWI. Tyneside based Holcomb has travelled the world working on prestigious cruise ship engagements. For a number of years, the Idaho born musician (he studied music at the Lionel Hampton School of Music) was based in Las Vegas and had the privilege of participating in a recording session at the famous Capitol Records’ studios in Los Angeles and sharing a stage with Al Grey and Bill Watrous. A star-studded quintet can be heard at the Globe Jazz Bar tomorrow night (Thursday, Nov. 22 - 8pm) when the Jazz Coop and JNE present the award-winning band ARQ. 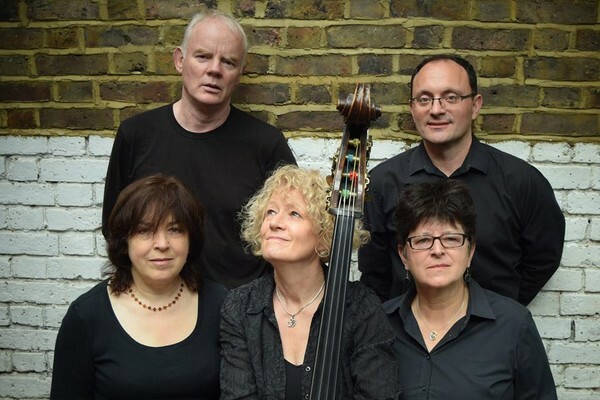 ARQ, short for Alison Rayner Quintet, was, along with BSH, a winner at the recent Parliamentary Jazz Awards ceremony and comprises five of the UK's finest. I first heard Deirdre Cartwright at the Side Café back in 2009 when, with fellow guitarist Kathy Dyson, they paid tribute to the late Emily Remler. Four years later, I heard her again, this time at a bar in Stoke Newington where Alison Rayner was on bass and Diane McLoughlin sat in on tenor. 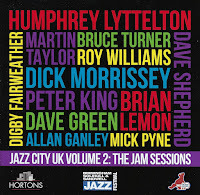 Pianist Steve Lodder has popped up at Scarborough Jazz Festival on several occasions whilst, although I may not have heard drummer Buster Birch live, I have heard him on disc including on an album with this present line-up. The album, August, was a cracker and I think we can expect more fireworks at the Globe tomorrow night and all for a tenner! This sounds like an ambitious mix, and perhaps an album which brings together 38 different musicians from 15 different countries might struggle to maintain a clear identity if each of their musical personalities is simultaneously foregrounded. 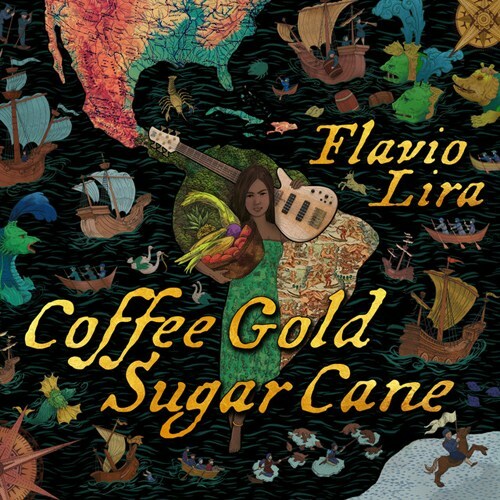 However, the album’s identity retains a central core of, in the broadest terms, Latin influence. Beverley Beirne (vocals); Nadim Teimoori (tenor sax); Jamil Sheriff (piano/composer); Garry Jackson (bass); Dave Walsh (drums). Jamil Sheriff’s ‘The Ilkley Suite’ is inspired by the North Yorkshire town and its surroundings, with compositions focused on the stones and waterways that help define the area’s character and heritage. Opening with The River Where We Live, the music plunges straight in, with currents of piano and saxophone, occasionally coinciding, a lilting, aural ebb and flow. Following on, the moody waltz Verbeia features the vocals of Beverley Berne, relating the tale of the Wharfe Goddess. “She rages, but tenderly…” and with this, as with the rest of his compositions, Sheriff has come up with some evocative lyrics to relate to the local legends. “Taking jazz improvisation to the next level through the core ideas of Thelonious Monk, Charlie Parker and John Coltrane. A manual for intermediate to advanced students on all instruments”. 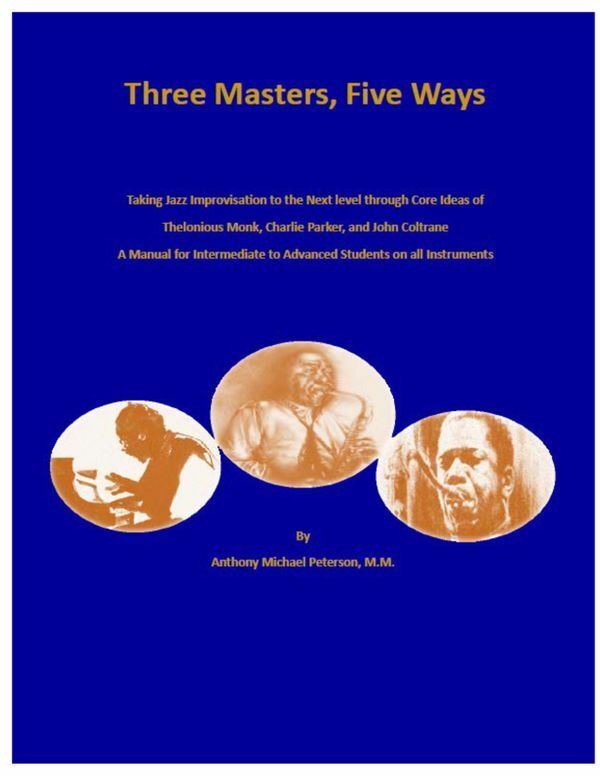 A new music theory and workbook which sets out to give a solid grounding in music theory then uses an analysis of the core or fundamental improvising techniques of three iconic and highly influential jazz icons to advance the student. Anthony M Peterson M.M. (Master of Music) from St. Louis, Missouri, began his musical journey as a classical guitarist before obtaining a scholarship from the St. Louis Conservatory of Music at the tender age of thirteen. Sad news that Don Fairley could not make it as he is recovering from another fall. We wish him well and hope he will have a quick recovery. With three key players on holiday the “deps” all fitted in seamlessly. Paul Gowland made a fantastic job of soloing on Desafinado - Stan Getz would have been proud! Bob also did a stylish solo with Willow Weep for Me on flugel. This was the second of two little publicised gigs at the Beaumont Hotel in Hexham. 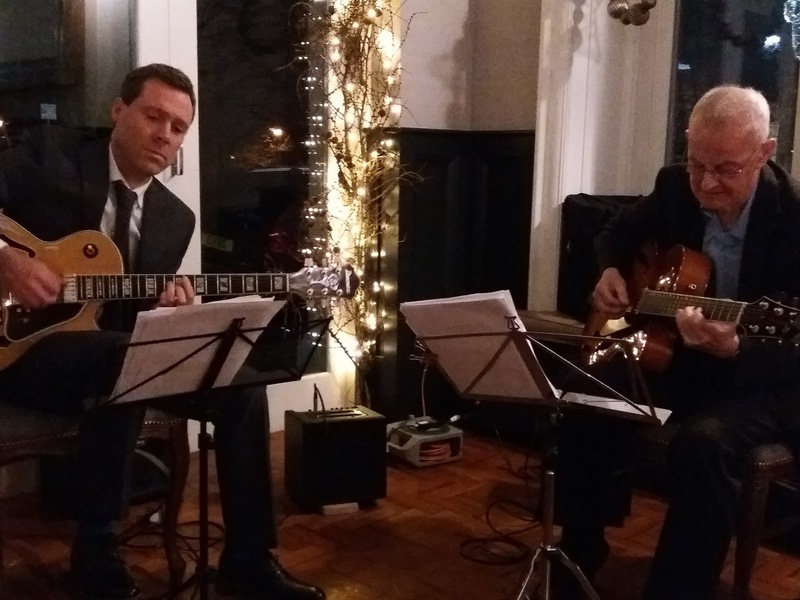 Local resident and fine jazz guitarist Giles Strong opted for an under-the-radar start to a new series of Monday evening jazz gigs, the series proper beginning next week (November 26). 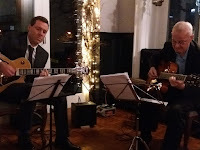 Light rain began to fall as Strong played the first number of the evening in the company of friend and fellow guitarist Roly Veitch. The duo sat unobtrusively in a corner adjacent to the hotel's reception desk. The Days of Wine and Roses greeted guests - some checking in, some checking out - and a busy dining room comprising residents and locals enjoying a Monday evening meal. The Velvet Revolution: Daniel Erdmann (saxes); Théo Ceccaldi (violin); Jim Hart (vibes). Charlie Collins and Friends: Charlie Collins (percussion); Eun-Jung Kim (komungo); Derek Saw (trumpet); Faye MacCalman (clarinet). At about 11 o’clock on Friday night, a bearded figure carrying a grey suitcase entered the upstairs room of the Cumberland Arms to a round of applause. French violinist Theo Ceccaldi had just arrived straight from Newcastle Airport after a tortuous journey from Toulouse. Like a real trooper and with no time to lose Theo joined the other 2 members of The Velvet Revolution to complete a stunning evening of music. Due to his late arrival, we were treated to a duo set from Erdmann and Hart. Some of the tunes were even world premieres as the very dry-witted Erdman explained. Their set was an unscheduled bonus which also included updates of Ceccalidi’s arrival time (the plane actually landed at 22.05 and luckily in these pre-Brexit times there were no immigration hold-ups). Quintet of the Year (2018): Mick Shoulder Quintet @ the Black Bull, Blaydon - Nov. 18. 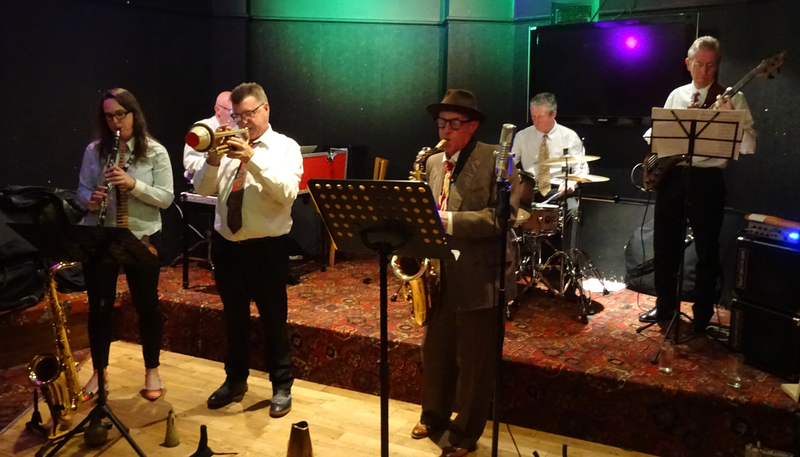 Graham Hardy (trumpet/flugelhorn); Lewis Watson (tenor sax); Dean Stockdale (piano); Mick Shoulder (bass); Russ Morgan (drums). (Review/photos by Lance. Photo of Graham Hardy courtesy of Roly Veitch). The original Quintet of the Year comprised Dizzy, Bird, Bud Powell, Mingus and Max Roach. The concert took place in Toronto in 1953 and featured five of the greatest modern jazz musicians ever. 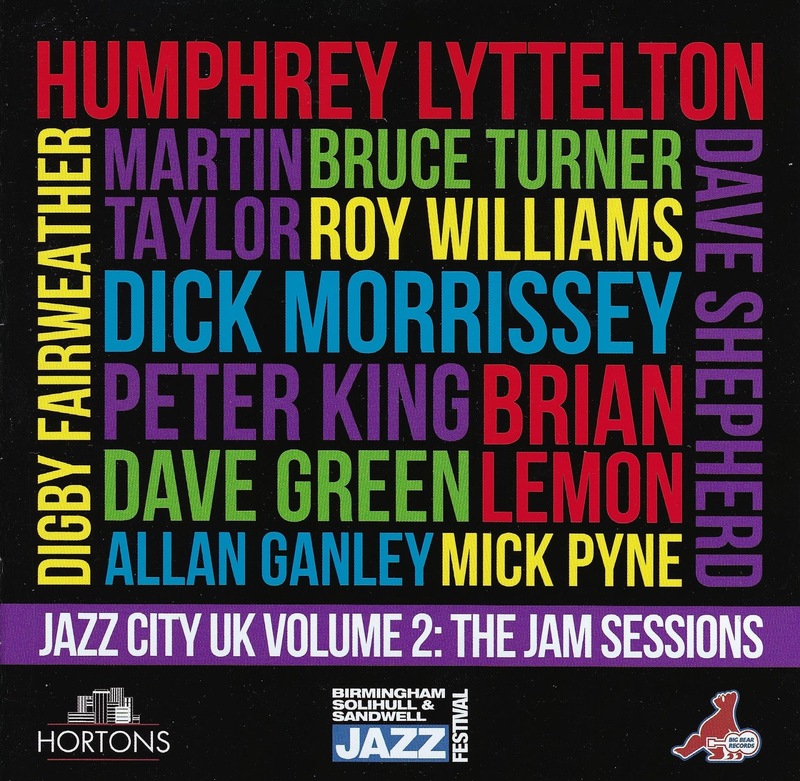 Since then, there have been other bands worthy of the title including Art Blakey's Jazz Messengers, the Horace Silver Quintet and the UK's own version - The Jazz Couriers. 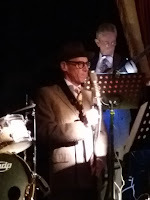 All three groups were referenced at Blaydon Jazz Club last night in a well-attended session by a band that must surely qualify for this year's title and I don't mean just on Tyneside but as far afield as you care to mention. Greg Yasinitsky is a new name to me but, better late than never. This fine saxist, composer, arranger and educator has been around for many years - 40 years plus in education as well as studio and live sessions with a diversity of talent that includes Stan Getz, Randy Brecker and Ray Charles. This and a wide assortment of music awards make him a voice to be reckoned with. His many skills are well-displayed here. 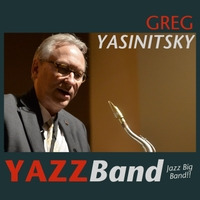 All nine titles were composed and arranged by Yasinitsky who also solos on alto or tenor on most of them and filled out the pared-down sax section on baritone. On the ballad Missing You his melodic side comes to the fore although not without a midway blast! The closing cadenza and the final few bars by the sax section are truly beautiful. 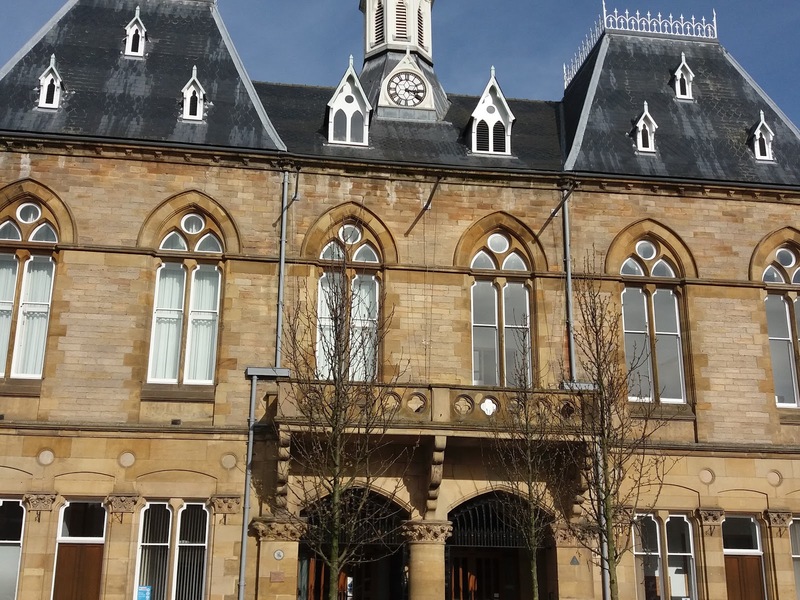 BSH's southern (that's County Durham) correspondent Tony Eales filed an enthusiastic report of Friday's events way down south. 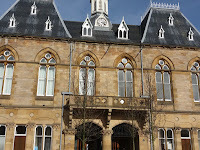 A lunchtime session in the first-floor cafe at Bishop Auckland Town Hall went down well with a sizeable crowd there to hear super saxist/flautist Sue Ferris* working in trio format with sidekicks Paul Edis, piano, and ace bassman Neil Harland.